Until 'James Fitzjames: The Mystery Man of the Franklin Expedition' was published, there was no public knowledge of who James Fitzjames' true father was - in fact it was a closely guarded secret. The book presents the evidence that his father was a British diplomat of the early ninteenth century called Sir James Gambier. Publication of the book put me in touch with (legitimate) descendants of Sir James, and through them I was able to see a portrait of Sir James, which they have kept down the generations and still retain. Here is a photograph I took of the portrait. There is more information and a close-up of Sir James' face on the book's website here. Can anyone spot a resemblance between Sir James and his ill-fated son, James Fitzjames, in the Franklin Expedition Daguerreotypes? Just for fun, I've put together a side-by-side composite here. Having made both black-and-white and reversed the Gambier image so that he's facing the same way, it seems to me there are several strong points of resemblance: the nose is very similar, along with the upper lip; the overall cast of countenance seems parallel. At the same time, Fitzjames's ear looks to be lobed, while Gambier's is not, and Fitzjames's brow-line looks considerably more decisive; his father looks like he wants to sneak away from something, while the son seems at least capable of a cold look of command! Thanks for getting the photo of the portrait up on the site, William! 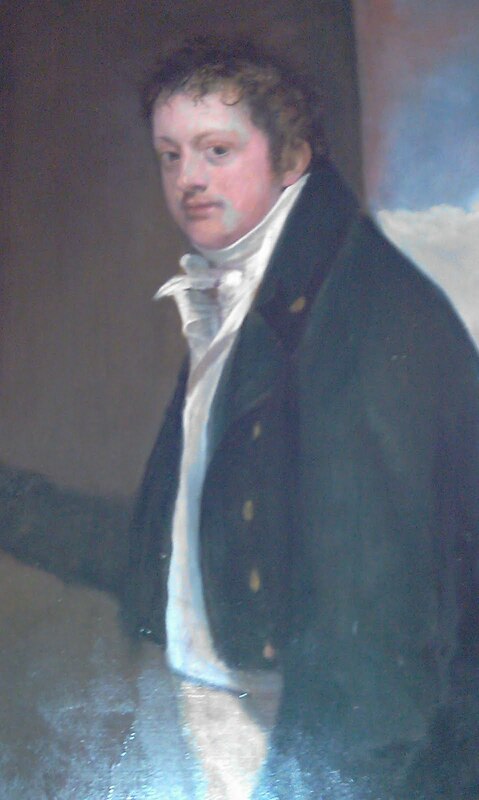 Russell, the flipped portrait of Gambier does indeed make the similar features of James Fitzjames stand out well! Thanks chaps. Not so sure there is such a difference on the ears, Russell? 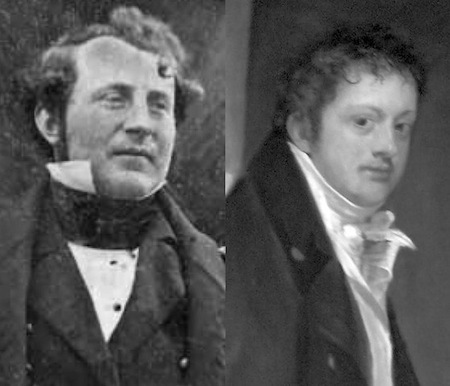 The other thing I thought is that the artist probably emphasised Sir James' eyes (as the 'window of the soul') in the portrait, whereas in the Daguerreotype, which appears to have been taken in the open air, Fitzjames' eyes are more closed. I think both men are approximately the same age in both pictures and one can speculate that for both of them their hair was receding at about the same rate. Again, I suspect the although hairline was probably similar, the artist in the painting was attempting to minimise hair-loss. Anyway, I think it is extremely interesting that there is such a close resemblence. I only wish I had been aware of this portrait when I wrote the book. The nearest I could find then was one of Admiral Lord Gambier ('dismal Jimmie') who was a cousin of both men. While he has a clear family resemblence, it is not as close. William, you've written that Sir Gambier is interred in one of the crypts at Kensal Green in London. Last April I went to visit Kensal Green to see the graves of Sophia Cracroft, Admiral Sir John Ross and the crypt where Lady Jane Franklin lies. Is Sir Gambier in the same crypt that Lady Jane lies in? I know there is another that is closed to the public due to safety concerns. I will be in London again in 2012 and want to go again to Kensal Green to see George Back's grave and will want to visit Sir Gambier's resting place, too. I also got to visit the site of Sir John Barrow's grave. It's now a little park and children were playing on the badly deteriorated stonework covering his resting place--that made for some good pictures. Gambier looks like a dissolute drunk.